Calzones are such a fun food to make and serve because everyone gets her own serving and you don’t need utensils to eat them. Another great thing is you can use all kinds of fillings. 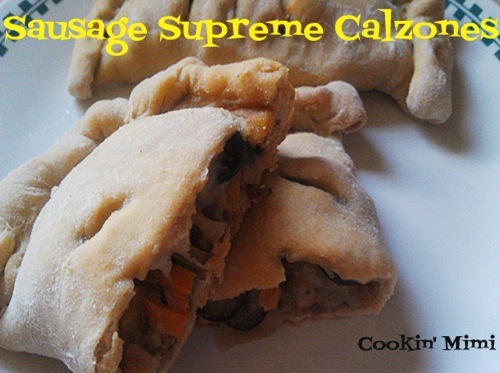 These sausage supreme calzones are the first of many upcoming calzone and homemade pocket recipes that I’m sharing. Preheat oven to 375 degrees. Spray two large cookie sheets. Crumble and cook sausage in a skillet over medium heat for 10 minutes or until browned and cooked through. Remove and set aside. Add oil to skillet. When hot add the mushrooms, peppers, and onions. Season with salt and pepper. Cook for 10 minutes or until vegetables have softened and cooked down. Stir in olives and set aside. Divide dough into eighths. Roll each eighth into a 6 inch circle. Place 2 Tablespoons each of sausage, the vegetable mixture, and cheese onto one half of each circle. Fold dough over top and seal by folding the edges toward the center twice and pressing down to seal and then pinching. Make two or three shallow cuts in the top to allow steam to escape. Place on prepared prepared sheets and bake for 20 to 25 minutes or until browned.